Synopsis: in her last home, Olivia Kidney met a lot of strange people – and not all of them were alive! Now her handyman dad's got a new live-in job at a posh private house and Olivia's hoping her life there will be normal. But no. The house is flooded by a sparkling lagoon complete with snapping turtles and you have to use a boat to get around! Then there's the handsome young owner, Ansel Plover, who seems quite charming. Until a neighbour warns Olivia that he's 'mad, bad, and dangerous’. So when she spots strange visitors arriving in the middle of the night, Olivia catches a whiff of weirdness. This house holds secrets – she can feel it. So with the help of her ghostly brother, Christopher, Olivia begins to unravel a mystery that will take her deep into the Spirit World, all over again . . Welcome back to the weird and very wonderful world of Olivia kidney. That’s right; people get out of my way. 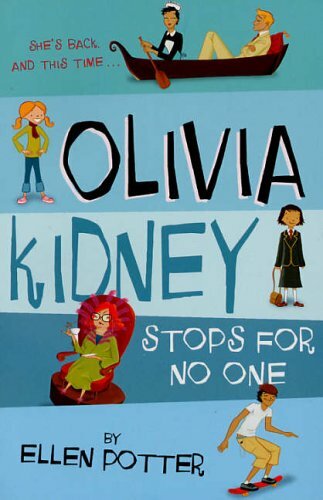 Olivia kidney stops for no one! Olivia kidney is no stranger to strange. In her last apartment building she met a lot of peculiar people. And not all of them alive! Now Olivia is on the move – again. This time to a house flooded by sparkling lagoon. But floating furniture and snapping turtles are only beginning. When Olivia spies visitors coming and going from the house by night, she’s determined to find out what’s going on. Then she discovers that someone very special is in big trouble, and Olivia is hurled on the craziest, most thrilling rescue mission ever. Review: this good was a really good read and it was the follow on to Olivia kidney and it was easy to get when you have read the first one and it’s a real story to get in to and Olivia moved to another apartment but this one is weird as it’s full of water and they need boats to get around and Olivia doesn’t have to worry about her father flooding the apartments and she made to a new school again and hopefully she doesn’t have to move again and get into a new school or have to make new friends again. I really like this book review my sister used it to help her as a test!